Many half-completed crafts are available at garage sales and thrift shops, and there is no shortage of quilt scraps, squares, blocks and quilt tops. I usually only have to stop at one location each month to find something I don't need. Recently, I stopped at a sale and found some 9-patch squares made by hand. 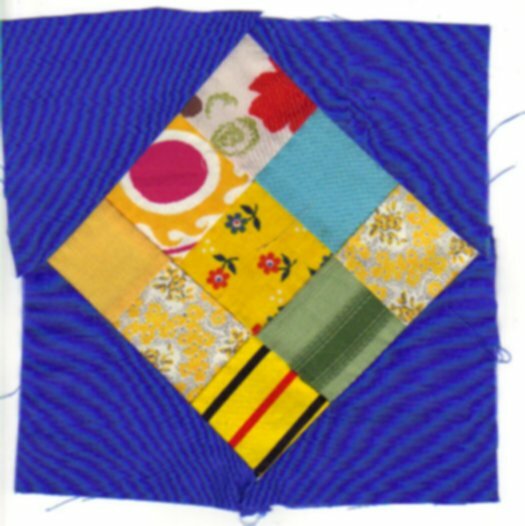 These squares aren't made by a real quilter -- the colors are totally random, mismatched, and some of the "squares" are downright ugly. They aren't particularly well-made and I wouldn't call them quilt blocks. They look like the start of a possible quilt block. The price was right, so I came home with them. 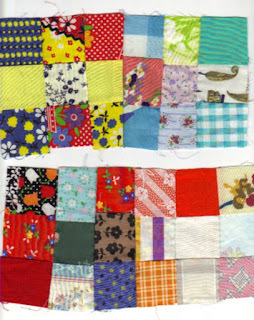 Some of the 9-patch squares were sewn together to make 18-patch rectangles and 36-patch blocks. The larger blocks look worse than the 9-patch, but somebody's Grandma spent hours making these. Because I like old fabrics, unfinished projects have a charm (speaking of charm, maybe these could make a charm quilt) that I don't find in yardage from the nearest JoAnn's or Hancock store. These squares have taken over part of the coffee table for about a month, so it's time to move them out or do something with them. I took some of the 36-square blocks apart and worked on making something of them. It takes patience to make grandma's squares into blocks, but you'll have older fabrics and may shortcut a completed project if you can use some of the work already done. 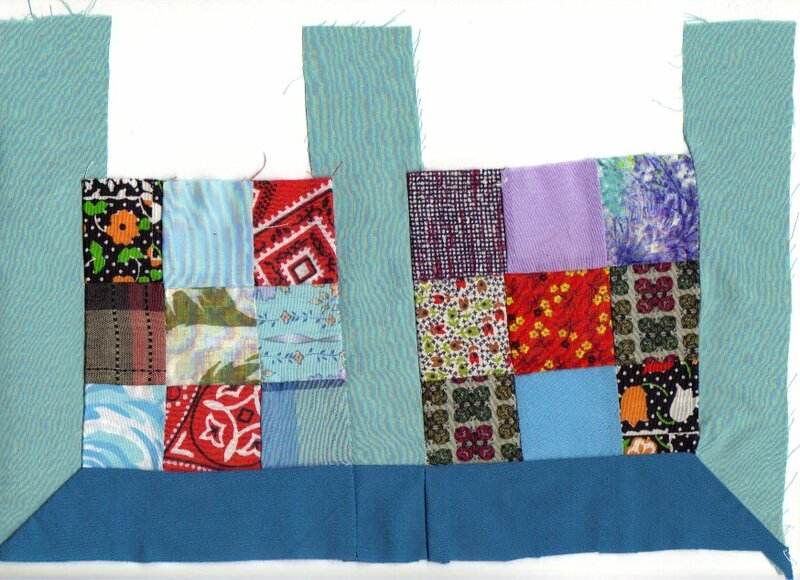 Analyze the issues with any pre-owned quilt projects, just like these 9-patches. Other than the stitching issues (corners don't exactly meet and the stitching is a little curvy) they are all colors, and no theme colors. There are no solid colors to break up the design. Sort some of the squares that have similar colors and shapes. These are approximately 4 1/2 inch squares, so I pressed some and measured squares to find similar sizes. Some weren't very usable because they didn't match at the seams, but some were larger than others, too. You'll notice I left the strips longer than necessary. That's so I can make mitered corners or continue the design. Leave yourself some options when you're experimenting. With the nine-patches already made, this will whip into a pillow or lap quilt in short order. Here's a different design block that could work. The sides of the nine-patch are 4 1/2 inches so I made triangles from a 5 and 7/8 inch diagonal with 4 inch sides. I cut two triangles at a time and came out with a 6 1/2 inch block that will finish as a 6 inch block. Here it is untrimmed. Once you get several blocks made, square and size them with the rotary cutter. Grandma didn't have the benefit of many of the tools we use for quilting today. When you're buying Grandma's work, buy clean, cared-for items that will withstand washing. Press all the pieces and pieced work before you start. Sort by color, size, or usability. Be ruthless in sorting as some may be too horrible to use. Work a sample block or two to see what's possible with what you have. Don't try to make a quilt or large item if the blocks aren't the same size or won't fit together. If you're a perfectionist quilter, you may not be pleased with Grandma's handwork. That's ok, too, so don't buy it. Sometimes it's more rewarding to create something from new fabrics than to try to rescue someone's leftovers. I've found some nice quilt blocks and tops in unusual places, and have made many pillows, baby quilts and full-size quilts from someone's incomplete sewing project. Don't pass on all of them -- you'll miss out on some creativity.